Despite all your efforts like blowing your nose or using nostril spray, your nose won't stop dripping and it's becoming red, raw and more tender by the minute. What can you do? The first thing you can do is to learn more about what a runny (dripping) nose is, what some of the common causes of it are and it's symptoms. Then, you can sit down with one of our Houston ENT doctors and discuss treatment options. So, what is a runny nose? A runny nose is an extra drainage your nasal and neighboring blood vessels and tissues in your nose produce. The drainage can range from thick mucus to a clear fluid. It can drain out of your nose and down your throat in the back or both. The terms "rhinitis" and "rhinorrhea" are often used when referring to a runny nose. Rhinorrhea is a relatively, thin clear nasal discharge. Rhinitis is nasal tissue inflammation from various causes that lead to a runny nose. 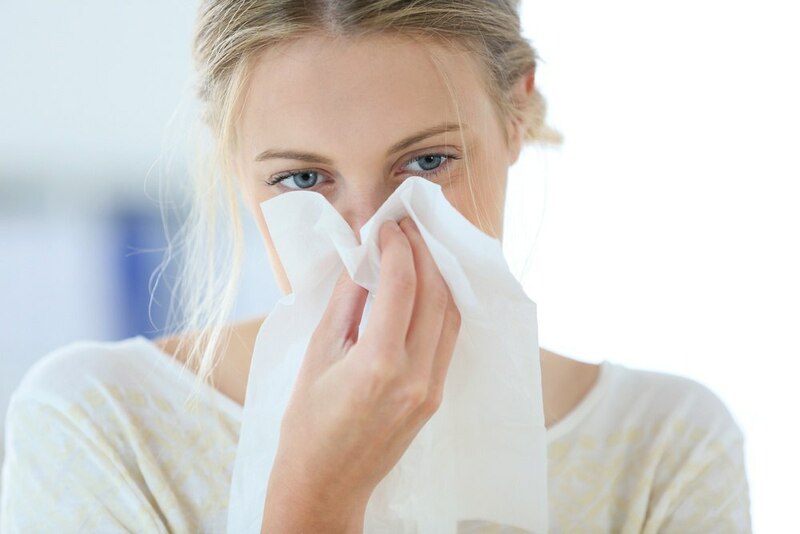 Nasal congestion might or might not co-occur with a runny nose. The doctor makes a diagnosis of nonallergic rhinitis after they rule out an allergic cause through blood tests, skin allergy tests or other tests. Nonallergic rhinitis involves a drippy, congested nose or chronic sneezing with no apparent cause. Nonallergic rhinitis symptoms are similar to allergic rhinitis (hay fever), but there's no typical evidence of the presence of an allergic reaction. Nonallergic rhinitis typically doesn't cause itchy eyes, nose or throat which are symptoms linked with hay fever or other allergies. A substantial link exists between asthma, rhinitis (allergic) and chronic sinusitis (sinus inflammation lasting over 12 weeks) in some people. Some evidence suggests up to three of every five patients have more than one condition. Post-nasal drip is a common characteristic of chronic rhinitis. Post-nasal drip is the accumulation of mucus in the back of your throat and nose resulting in mucus dripping down from the back of your nose, or it gives the sensation of this feeling. It may lead to a chronic cough, chronic sore throat or throat clearing. It's often caused by impairment of the regular clearance of mucus from your throat and nose or by thick or excessive mucus secretions. You have symptoms that over-the-counter medicine or self-care doesn't relieve. You experience certain side effects from OTC or prescription medicines for rhinitis. Depending on what's causing your runny nose, long-term effects may vary. Nasal obstruction and nasal irritation can affect the quality of life of a child if it's longstanding. Nasal obstruction can impact sleep quality. Being able to breathe from the nose is essential for childhood facial development. In rare cases, acute sinus infections can result in more severe infections if left untreated. Rhinorrhea and nasal obstruction can affect ear health and hearing since your middle ear drainage pathway is through your nasopharynx (back of your nose). Crying: Tears drain through your tear ducts, when you cry, and into your nasal cavity, and then the nose. Colds and flu: Mucus produced from illnesses can cause temporary nasal obstruction by filling the nasal cavity. Adenoid and/or sinus infections: The cavities of the face or sinuses that drain into your nose could fill up with infected mucus, leading to inflammation of your sinuses (sinusitis). In children, the adenoids (nasopharynx tissue) can also become infected, leading to a similar infected mucus production. Cold Weather: When the weather becomes cold, it can sometimes cause a mucus-producing reaction. Allergic rhinitis: A nasal reaction to allergens like pet dander or pollen or allergies can cause mucus. It can be year-round or just seasonal. Spring attacks are typically due to pollen from trees, while grass pollens cause attacks in the summer and weed pollens cause attacks in the fall. Many individuals who have allergic rhinitis have more than one allergen sensitivity. Nonallergic rhinitis: A nasal reaction to irritants, like pollution or smoke, or a reaction of the body to other stimuli like hot food or cold weather can cause mucus. Smog, dust, strong odors like perfumes, secondhand smoke can all trigger nonallergic rhinitis. Being exposed to chemical fumes like you would in some types of occupations also can trigger nonallergic rhinitis. You can also develop nonallergic rhinitis from things like alcoholic beverages or spicy, hot foods. Nasal polyps: Grape-looking growths in your nose lining. Swollen/large turbinates: Your turbinates (bones along the inside of your nose) can swell due to infections or allergies, resulting in nasal obstruction. Large adenoids: Enlarged tissue in children in the back of their nose. Nasal tumors or cysts: In rare cases, obstruction from malignant or benign tumors or cysts may occur; usually seen when the symptoms only affect one side of the nose. Foreign body insertion: Nasal obstruction in children due to placing objects in the nose like a bead or peanut that also causes foul-smelling mucus drainage. Deviated nasal septum: The left and right sides of your nose are divided by a wall made of cartilage and bone referred to as your nasal septum. Sometimes, the septum leans more to one side and causes an obstruction on that side in a condition known as a deviated septum. The presence of this deformity may be seen at birth or be the result of a nose trauma later on in life. Piriform aperture stenosis or choanal atresia: Piriform aperture stenosis is where there's a narrow bony nasal opening that obstructs the nose. Choanal atresia is where the nasopharynx is closed off with tissue and/or bone at birth. When this is bilateral (present on both sides), it's often present immediately after birth. If it's present only on one side, however, it's often not identified until later on in life. Often rhinorrhea will go away on its own. But, if it persists or lasts more than 10 days, it could be an indication of another condition like any of these listed above. Consult our doctor, especially if it's accompanied by a high fever. When you have a persistent runny nose, your primary care doctor may refer you to an allergist or an Otolaryngologist (ear, nose and throat doctor). The specialist will examine along the inside and front of your nose and obtain a complete history. Once they find the source of your runny nose, they'll sit down with you and go over the treatment, which may include an effective and rather new procedure known as Clarifix® we'll cover in detail in an upcoming blog post. To get evaluated for chronic rhinitis, contact us here at Houston ENT & Allergy Services by calling 281-649-7000 or by requesting an appointment online.